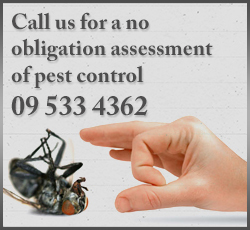 Pest Solutions is an Auckland based private company delivering exceptional results to the commercial sector. Our core values of ‘a positive can do attitude, initiative and flexibility’ fit with our company commitment to challenge our processes and minimise or alleviate adverse effects that impact on the environment. In order to achieve this, we will comply with all relevant regulations and are committed to continual improvement and prevention of pollution. Support the requirements of current New Zealand environmental legislation and codes of practice. Minimise consumption through the reduction, reuse or recycling of materials as much as possible. Seek to prevent pollution by reducing the amount of waste arising from our activities. Maintain equipment and vehicles to manufacturer’s warranties to ensure minimum emissions in our activities. Ensure disposal of waste is conducted to recommended guidelines. Where possible purchase products and services that do the least damage to the environment and encourage others to do the same. Ensure all Pest Solutions employees conform to the high standards required through an employee induction program that reinforces our commitment to the environment. We are committed to providing positive sustainable outcomes whilst minimising the impact on the environment through the implementation of the policy. This policy will be reviewed and updated in November each year.